﻿ Along with St. Augustine, St Thomas Aquinas and St Scholastica, Saint Gemma too has also been commonly invoked as a patron Saint for students around the world for many decades. The reason for this is because Gemma was a very conscientious student who worked very diligently at her studies, as we shall see from the various testimonies in the story below. “Dear Gemma was only two years old when confided to us. From that early age she gave evidence of ripe intelligence and seemed to have already attained the use of reason. She was serious, thoughtful, wise in everything, and differed from all her companions. She was never seen to cry nor to quarrel; her countenance was always calm and sweet. Whether petted or blamed, it was all the same, her only reply was a modest smile, and her bearing was one of imperturbable composure. Her disposition was vivacious and ardent, yet during her whole time with us we were never obliged to punish her; for in the small faults that necessarily attach to that tender age, the slightest reproof was enough for her and she at once obeyed. She had two brothers and two sisters at school with her. She was never seen at variance with them and invariably yielded the best of everything to them, depriving herself of it. At the school dinner, Gemma was always satisfied, and the smile that played on her lips was her only complaint or approval. She learned at once all the prayers that are daily said by children, although, if repeated together, they would occupy half an hour. When five years old, she read the Office of Our Lady and the Office or the Dead from the Breviary as easily and quickly as a grown person. This was owing to the special diligence of the angelic child, from her knowing that the Breviary was a network of Divine praise. She was assiduous at her studies and quickly learned all that was taught her, even things that were superior to her tender years. Gemma was greatly loved in the school, especially by the little girls, who always longed to be with her." At age 7, due to the death of her mother, Gemma had left school for awhile and went to live with her Aunt, while her father accustomed himself to the loss of his wife. After a few months he called Gemma and his other children back to him That was about Christmas of the same year, 1886 .This affectionate father had not the heart to separate himself from Gemma by placing her back at the boarding school. He therefore determined to send her as a half-boarder to finish her education at the renowned establishment in Lucca managed by the Sisters of St. Zita and commonly known as the “Guerra Institute”, from the name of its foundress, Venerable Sr. Elena Guerra. "I began to go to the school of the Sisters; I was in Paradise!" And she had good reason to say so. For having mistresses consecrated to God by profession, with many pious practices between the hours of study and work and recreation, she, who from her earliest years had been accustomed to live rather in Heaven than on earth, had certainly found a joyful atmosphere. Very soon indeed her new teachers and companions were struck by her rare dispositions and drawn to admire and love her. She on her side strove to pass things off, in order to keep hidden from the gaze of others. But she did not succeed in preventing the candor of her soul from radiating through her whole person. This was particularly visible in her eyes. Hence one of the religious said to her on a particular occasion: "Gemma, Gemma, if I did not read you through your eyes I should not know you." Although she was in years among the youngest in her class, yet so great was the reverence with which she inspired the others that all looked up to her as the first among them. 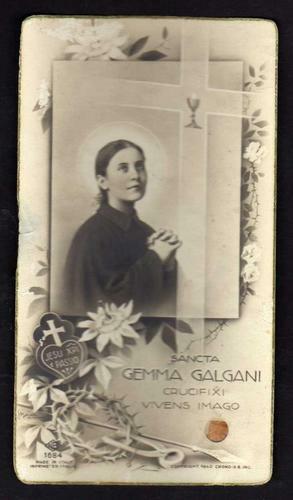 During the interviews for the process of Beautification/Canonisation, the common statements concerning Gemma’s childhood personality was that Gemma was normally quiet and reserved, while at the same time very kind and loving towards everyone. She was very honest and sincere in her words: white was white and black was black. In fact, this sincerity with her words sometimes hurt the feelings of others, but for Gemma this was unintentional. When she was criticized or accused for some reason or another, she would either remain silent or would reply simply: “You are right. I am sorry. I will be good and will not do it again” and she would say so with such a sweet, sincere countenance that the accuser would suddenly be completely disarmed, and on one occasion such an accuser confessed that at Gemma’s reply and the look on her face that this accuser couldn’t help but to spontaneously throw her arms around Gemma’s neck and hug her with the utmost affection. She spoke openly to all and could not imagine how such sincerity could displease anyone. When this candid child wished to hold a long conversation, a thing which seldom happened, it was so interesting that one could remain listening and talking to her for any length of time without feeling tired. This sometimes happened at the school, where all the pupils loved Gemma so dearly. And when she fell ill and had to leave school permanently, there was general grief among her school companions. "Once she had to confess to me that she had passed very well in all subjects in her class, and in French had secured very high marks. Some of her companions having failed were sad and sore about it. She said to me: "I am sorry that some of my companions did not pass. I should have liked all to pass, for then I should have been happier myself." She did not like amusements or games, not even those suited to her age, and did not play with dolls. I remember that on one occasion her father wanted her to go to hear the city band which was to play in the Piazza. "Gemma," he said, "take your sister this evening to hear the band." But she answered: "No, Daddy, let us go to the Walls; there we shall enjoy ourselves better." The people of Lucca being gathered round the band the path on top of the walls was deserted. They would also be able to go along in good time to the evening devotions in the parish church. Unlike other children Gemma never went alone into the City." Yet, she was often found studying assiduously and frequently—so much so that such remarks as these were addressed to her by her family: 'Why so much study! Don't you know enough already?'. “With regard to her mistresses, including the Reverend Mother Superior, Mother Elena Guerra, who was her mistress in her finishing course in 1891-1892, they all esteemed and loved Gemma greatly. By reason of my office, I had occasion to be with her more than the other Sisters and was constantly struck by her solid piety and childlike candor. Nay, from the very first days that I knew her, she impressed me as being a soul most dear to God, yet hidden from the world. I noticed later when urging the children to the practice of a little mental prayer in the morning and examination of conscience in the evening, that she, who was already advanced in these exercises, took them always more to heart than her companions. But I never could get her to tell me how much time she devoted to them, and only from a few short answers she gave when questioned on the subject was it made evident that she employed much time in meditation. "Gemma longed to hear the Word of God and showed the greatest satisfaction on the days when the priest, the Rev. Raphael Cianetti, came to explain the Catechism. The same may be said with regard to the sermons that were preached in the Institute on various Feasts of the year. She had resolved to become a Saint, like the Venerable Bartholomea Capitanio, and reminding her of this, I often said to her: "Gemma, remember that you have to become a truly precious jewel." As there cannot be true sanctity unless it is acquired at the foot of the Cross, God put into Gemma's soul an ardent desire to know the mystery of the Redemption. To this end she sought from her mistress, Sister Camilla Vagliensi, and besought her so often to explain Jesus’ Passion to her, that the Sister consented to do so on the days on which her disciple should get the maximum of good marks both in lessons and work. "What better reward than this?" said Gemma to herself, and setting to work with redoubled diligence, she succeeded from that day in almost always gaining the highest number of marks and thus very often securing her desired instruction. "How many times," she said to me when talking over these things, "did not the thought of the love of Jesus, in suffering so much for us who are so ungrateful, force the Mistress and me to cry together!" This good religious sister also taught her how to practice some little mortifications, in order to compensate Jesus for her many backslidings. She spoke to her of various instruments of penance, whereupon the fervent child procured some and fitted them for herself; but, notwithstanding all she said and did, she was not allowed to use them. Meanwhile under the guidance of the same religious, she made up for the refusal by a rigid mortification of her eyes, her tongue and her senses; and particularly of her will. In this exercise, she became truly admirable during the rest of her life. 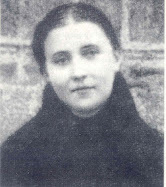 Things went on in this way until March 1888, when God was pleased to call to Himself this pious mistress, Sister Camilla Vagliensi, a religious of rare holiness of life. Then Gemma was placed under the direction of another equally virtuous teacher, Sister Julia Sestini, mentioned earlier in this article, who was gifted with a singular spirit of prayer. "Under this Mistress," Gemma stated to Fr. Germanus, "I too began to have a great desire for prayer. 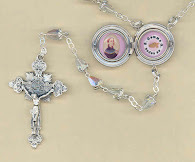 Every evening, immediately on coming home from school, I shut myself in my room and said the whole Rosary on my knees. Also several times during the night, I rose for about a quarter of an hour and recommended my soul and its needs to Jesus." This angelic child, persevering in her good dispositions and full of fervor, continued during the whole of that year (1888) to attend the same school and began to take her younger sister Angiolina (Angelina) with her. The Gospel words written of Our Blessed Saviour could well be applied to her: she continued to grow in wisdom and grace before God and man. 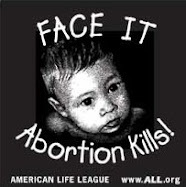 But a great loss for the poor child was pending. Her brother Gino of whom Gemma loved so dearly fell victim to tuberculosis--the same disease of which their mother died, and was soon at the point of death. Gemma and Gino loved each other tenderly. They were two souls in one, seeing and feeling alike, especially in all that regarded spirituality and piety. Hence they became inseparable in this last extremity. Whenever Gino became aware that his sister was in the house, he wished to have her immediately at his bedside. She saw clearly the danger of contagion of tuberculosis, but regardless of her own life, she remained close by his pillow day and night, serving and comforting him and suggesting holy thoughts to prepare him for eternity. This pious young man died a holy death in September 1894, and soon after Gemma too fell ill and had to remain in bed for three months. Nothing could exceed the anxiety of her family about her. "I cannot give an idea," she said, "of the care they all lavished on me, especially my father, whom I often saw crying and begging of God that he, rather than I, might die." It would seem that Heaven heard her fathers prayer because within two years time he died. As God willed it, she recovered, but her sickness left her so weak and shaken that it was found necessary to forbid her to return to school. With her usual resination to the Will of God and to her father's wish that she should leave school, she calmly remained in the solitude of her home, being then in her fifteenth year. In this way God often checkers the lives of His Elect between roses and thorns. There is no consolation coming from Him whose sweetness is not soon followed by the bitterness of some cross. Blessed are they who, like Gemma, know how to accept both consolations and crosses, roses and thorns, with equal resignation and courage! It would be difficult to speak of Gemma’s school years without mentioning one of the greatest high points of this time in her life–Gemma’s First Holy Communion--for which she expressed her desire to make at once on going to the Sisters' school. This great act was to be one of the crowning points in Gemma's life, so far as she was concerned. For a long time Gemma was being consumed by her longing to be united with Jesus in the Blessed Sacrament of the Altar. For some years before, her devout mother had instilled into her a knowledge and foretaste of its sweetness; and, in order to excite within her more and more a desire for the Bread of Life, she very often took her before the Tabernacle. At this point Gemma was then nine years old, and already at that early age her heart ardently desired to receive Jesus in Holy Communion. She longed to have Him and repeatedly with tears besought her confessor, Monsignor John Volpi, her father and her school teachers to give Him to her. The prevailing custom, however, was against her; the more so because she looked much younger than she really was, owing to her small and delicate frame, so that, at nine years of age, she appeared to be scarcely six. But Gemma often repeated her entreaties: "Give me Jesus," she would say, "and you will see how good I shall be. I shall be quite changed. I won't commit any more sin. Give Him to me, I long for Him so much, and I cannot live without Him." Her confessor, Msgr. John Volpi, later on Bishop of Arezzo, gave way at last to Gemma’s repeated entreaties, so unusual in a child of her age. He assured her father of her great worthiness and said: "If we do not want our Gemma to die of longing, we must allow her to go to Communion." “….He [Gemma’s father] gave me his consent in the evening, and early next morning 1 went to the convent, and remained there ten days. During that time I saw none of our family. But oh, how happy I was! What a paradise! Immediately on entering the convent enclosure, I ran to the chapel to thank Jesus and, with all the fervor I could command, I implored of Him to prepare me well for my Holy Communion. Then I felt, rising in my heart, an ardent desire to know in detail all the life and sufferings of Jesus." While her pious mother initiated Gemma from her earliest years in meditation on the Passion, and the religious in the school taught her to continue it, yet who was it who had told this child how our Saviour's Passion allies itself so intimately with the mystery of the Blessed Eucharist, that these two great mysteries are completely bound and united to each other? Without doubt, that same Holy Spirit was again her Teacher who even in her tender years had so divinely enlightened and inflamed her soul. "Whoever feeds on Jesus shall live of His Life." 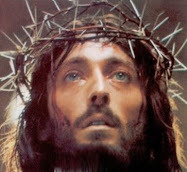 These words filled me with the greatest consolation, and I went on reasoning thus to myself: "When Jesus, then, comes to me I shall no longer live in myself because He will live in me!" And I almost died with longing to be able to say those words: "Jesus lives in me!" Sometimes I passed the whole night meditating on them, all inflamed with desire. I prepared for my General Confession, and made it at three intervals to the Rev. John Volpi and finished it on the Saturday, vigil of the happy day! That was the 19th of June, 1887, to which day the solemnity of the Feast of the Sacred Heart of Jesus had been transferred from the previous Friday. Today is the vigil of the day of my First Communion, a day for me of infinite contentment. I write these lines only to assure you of my love and to move you to pray to Jesus, in order that the first time He comes to dwell in me, He may find me disposed to receive all the graces He has prepared for me. I beg your pardon for all my disobedience and all the pain I have ever given you, and I beg of you this evening to forget them all. I ask you to bless me. "The Sunday came at last. I arose quickly. 1 ran to Jesus for the first time. My longings were finally gratified. I then understood the promise of Jesus: "He that eats My flesh remains in Me, and I in him"
My Father, it is impossible to explain what then passed between Jesus and me. He made Himself felt, oh so strongly, in my soul, and then understood how the delights of Heaven are not like those of the earth. I felt seized with a desire to make that union with my God everlasting. 1 felt more detached from the world and more than ever disposed to recollection. 1. I will confess my sins and receive Holy Communion each time as if it were to be the last. 2. I will often visit Jesus in the Blessed Sacrament, particularly when afflicted. 3. I will prepare for every Feast of Our Blessed Lady by some mortification, and every evening I will ask my Heavenly Mother's blessing. 4. I will endeavor to keep always in the presence of God. 5. Every time the clock strikes I will repeat three times: My Jesus, mercy! -May Saint Gemma, the patron of students, be our heavenly advocate and friend. St Gemma, pray for us! This is a lovely post. I will consider this name as my confirmation name. 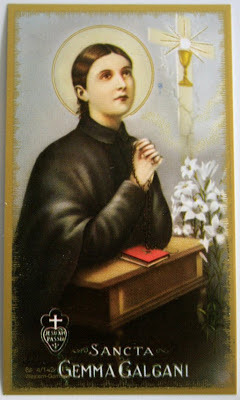 i will choose this saint as this years saint for my class room!